Sanctification as singlemindedness | Open Our Eyes, Lord! Just ran across this from Calvin. By “integrity” he doesn’t mean what we usually do (ethical consistency) but “singlemindedness”, the opposite of “doublemindedness”. Let us set this before our eye as the end at which we ought constantly to aim. Let it be regarded as the goal towards which we are to run. For you cannot divide the matter with God, undertaking part of what his word enjoins, and omitting part at your own pleasure. For, in the first place, God uniformly recommends integrity as the principal part of his worship, meaning by integrity real singleness of mind, devoid of gloss and fiction, and to this is opposed a double mind; as if it had been said, that the spiritual commencement of a good life is when the internal affections are sincerely devoted to God, in the cultivation of holiness and justice. Don’t critique Calvin before reading a bit of his writings! 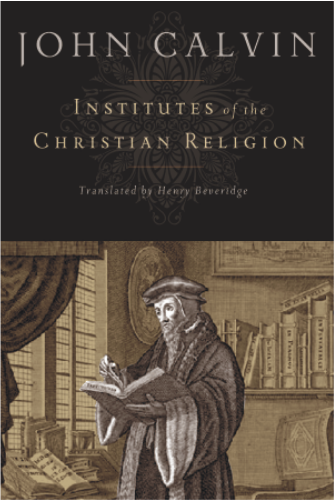 The reader can listen to the Institutes as audible files from librivox.org. The human contradiction…the dichotomy and division within the self, is a thing of the past. The radical nature of this new being implies an undivided integrity of God’s claim upon us.